Kaye Dacus has a new novel out--Follow the Heart is the first book of A Great Exhibition series. 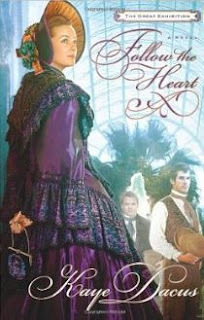 Set during the Industrial Revolution and the Great Exhibition of 1851, Follow the Heart is a “sitting-room romance” with the feel of a Regency-era novel but the fashions and technological advances of the mid-Victorian age. Kate and Christopher Dearing’s lives turn upside down when their father loses everything in a railroad land speculation. The siblings are shipped off to their mother’s brother in England with one edict: marry money. At twenty-seven years old, Kate has the stigma of being passed over by eligible men many times—and that was before she had no dowry. Christopher would like nothing better than to make his own way in the world; and with a law degree and expertise in the burgeoning railroad industry, he was primed to do just that—in America. Though their uncle tries to ensure Kate and Christopher find matrimonial prospects only among the highest echelon of British society, their attentions stray to a gardener and a governess. While Christopher has options that would enable him to lay his affections where he chooses, he cannot let the burden of their family’s finances crush his sister. Trying to push her feelings for the handsome—but not wealthy— gardener aside, Kate’s prospects brighten when a wealthy viscount shows interest in her. But is marrying for the financial security of her family the right thing to do, when her heart is telling her she’s making a mistake?